Today I’m taking a break from the Holidays to bring you this very special Ribbonista Hop. The photo of the card does it absolutely no justice. I used DCWV glitzy paper it seriously glimmers with NO mess involved! Just like my Mess Free Glitter Holiday Painting! I made a basic card with no fuss and added the garter to embellish, great double duty eh? I made the garter from 100% May Arts ribbon! I used elastic ribbon for the base and adorned it with lace and silk. 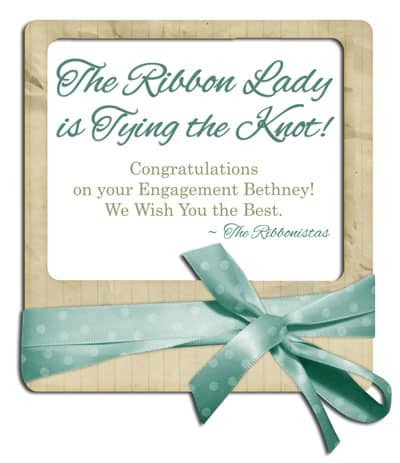 Can you imagine the ribbon lady’s wedding, I’m sure it will be laced (pun intended) with the most beautiful designer ribbons around! She should defiantly have her leg decorated too! Thats not all, please hop along to see what the other ladies have crafted up to celebrate the Ribbon Lady’s engagement. Leave a comment here and stop by the May Arts Facebook page to congratulate Bethany and you could win a prize too! Prize includes a mix of products from Faber Castell / Design Memory Craft, Authentique, UmWowStudio, DCWV, Graphic45, Gauche Alchemy, Viva Las VegaStamps!, Core’dinations, and Amazing Crafting Products. What an awesome idea! Will be casing this one for sure! I love that you made a garter, grin!!! Stunning flowers. Ha! I know mine was the typical blue one! very pretty garter! thanks for sharing. Oh Em Gee! This is S T U N N I N G ! ! ! LOVELOVELOVELOVELOVE the garter! It is simply divine!!! So far this is my absolute favorite card along this Engagement party hop! TFS! Thanks Barbara, I love love love your comment! Beautiful garter!!! What a great keepsake! What a neat idea adding the garter into the card. Gorgeous! You did beautiful work, Virginia! Love it! Gorgeous and such a sweet idea making it into the embellishment of the card!! Wish that Facebook weren’t required for the giveaway. I don’t have access to FB, but I am hopping and commenting all the way around, anyway. Sorry Janice, I didn’t make the rules on this one! I’m sure your name will be entered into the pot for commenting! 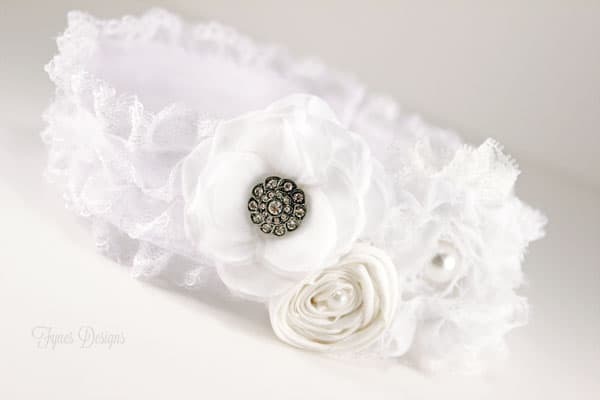 Oh, what a GORGEOUS garter and clever way to make a very precious card – LOVE IT!!! What a beautiful garter. Love the addition of it to a card of LOVE. Beautiful garter and card, love the vintage look of the garter! Congrats to the lucky couple! This is such a great idea! 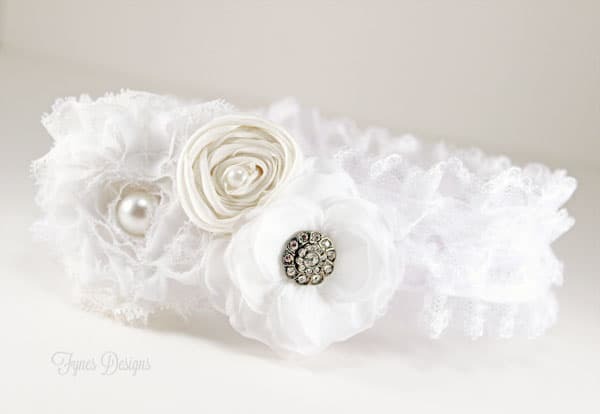 What a beautiful garter and love the stickpin you added! Such an amazing idea! The garter is beautiful! I love the ribbons! Thanks for sharing it! Hi Virginia, thank you for sharing your talent o Friday Features, I love the garter, how fun!!! And I was aslo checking out your other DIY projects, the polka dot toolbox, dang that turned out cute too!!! Wonder if you would stop back by and share it? I would love to feature next week! Ok Hope you have a great weekend! Pinned & shared. Thanks for joining the inspiration spotlight party!